It reminded us of the story of the Passover. As we watched, the clouds over the distant hills turned grey, then black. The hills themselves then turned dark. Moments later, the valley was plunged into darkness. 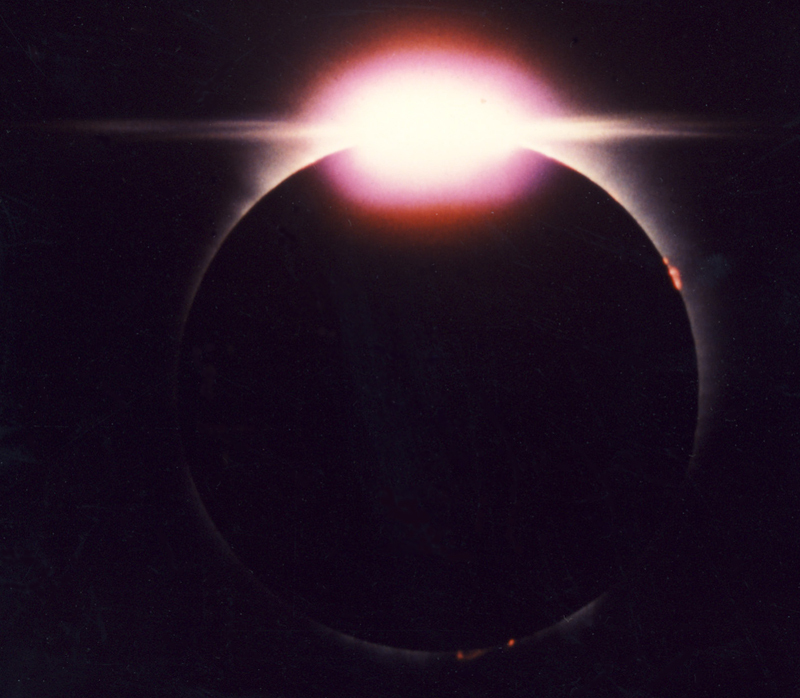 The first 10 days of the 1991 eclipse trip was an organised eclipse tour with Explorers Travel Club. It was my first visit to the Americas. It was the first eclipse trip with my future wife, Talaat Qureshi - she stayed for two months. Two friends, John Mears and John Harbour, came only for the tour part. A flight took us to to Los Angeles in the USA ("Are you or have you ever been a Communist?") where we stayed for 3 days. We then flew south to Mexico where we saw the eclipse described below in Baja California. After the eclipse, Talaat and I travelled independently though Mexico. I continued alone to Belize and Guatemala. After 7 months I returned to London from Guatemala City via Miami ("Are you or have you ever been a Communist?"). San Jose del Cabo is a small tourist resort on the southern tip of Baja California in Mexico. The surrounding countryside is mountainous desert covered with cacti. Some of the cacti were huge, three pronged trees, just like in cowboy films! The sun shone brightly; the sea was blue and the beaches fine. This was a perfect place for watching eclipses. 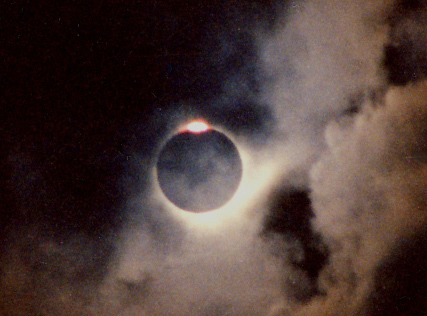 The 1991 eclipse was due to be nearly seven minutes long: there would be none longer in my lifetime. As in 1988, I met somebody from the previous eclipse. Patrick was from London; I had sent him photos from the Philippine eclipse as his camera had been stolen as soon as he arrived in Manila. There were many visitors for this eclipse because it was a long one and because Baja California was a holiday resort for North Americans. Accommodation was packed and supplies had run out. A sea food restaurant we patronised had no sea food, no coffee and no desert. The evening before the eclipse there was a star party on the beach. Hundreds of astronomers had come along with all their star-gazing equipment. Telescopes of all shapes and sizes had been set up pointing in different directions. We wandered around looking at planets, star clusters and nebulae. One telescope was very popular. It was pointing at the planet Saturn. Talaat, was excited at seeing its rings for the first time: "it's just like a photo!". Writer and BBC broadcaster, Patrick Moore, was sitting on a deck chair answering questions. Since I had grown up reading his books and watching Sky At Night, I was excited. In San Jose del Cabo itself, the eclipse would be six and a half minutes long and most people were staying there. I was part of a group of 25 or so who had booked a bus to take us 20km inland to the centre line. Here the eclipse would be just a touch under seven minutes long. Near the village of Santiago, we found a ridge surrounded by flat desert. A British ex-soldier in the group declared that this was the centre line. He had staked out the area and was certain. He had already seen eight total eclipses and went on to tell us the exact number of minutes and seconds of totality that he had seen. He was very keen to experience every second of totality that he could. We broke up into small groups and climbed onto the ridge. There was a small cemetery on the flat top. It afforded views in all directions. As the sun climbed in the sky it began to get hot. Our supply of water and peanuts kept us watered and salted and umbrellas kept us cool. Insects whirred constantly. Hummingbirds and lizards darted amongst the cacti. First contact was at 10:24 and we noticed the first bite missing from the sun. No changes were apparent until after 11:30. The light mellowed and we could feel it cooling. It was still hot and the sound of insects was deafening. Around 11:45 conditions were becoming eerie. There was a stillness in the air. The eastern sky was turning slowly pink. In the West the sky was becoming intensely blue and the clouds over the distant hills stood out in contrast. It all happened very quickly now. Thin high clouds appeared above us as the air cooled. The approach of the moon's shadow. A minute before totality we could see the moon's dark shadow approaching from the West. It was dramatic to see it coming towards us travelling a kilometre every two seconds. It resembled a ghostly apparition. It reminded us of the story of the Passover. As we watched, the clouds over the distant hills turned grey, then black. The hills themselves then turned dark. Moments later, the valley was plunged into darkness. Finally we were enveloped. Totality began at 11:49. It was dark at noon. The misty clouds alternately passed over the sun then cleared. We could see the bright inner corona. A huge red prominence could be clearly seen. It slowly disappeared as the black Moon moved across the Sun. The Moon's motion uncovered prominences on the other side of the sun. Venus was clearly visible. It had turned cool; long discarded jackets were put on. The insects had fallen silent; instead birdsong could be heard, a dawn chorus at noon. The sky was a dark blue. The horizon was red all around. As the 200km wide shadow passed over us, we could see it brightening in the West. We looked up and saw a brilliant diamond ring gleaming at the edge of the Sun / Moon for five seconds. It lit up the high clouds and lit up the landscape. Night had become day in moments. The diamond ring (plus prominances). Totality was over. I had just expereinced the longest total eclipse of the Sun that I would ever see (6 minutes 52 seconds). That night we celebrated in a restaurant that had run out of food and had no drinks. 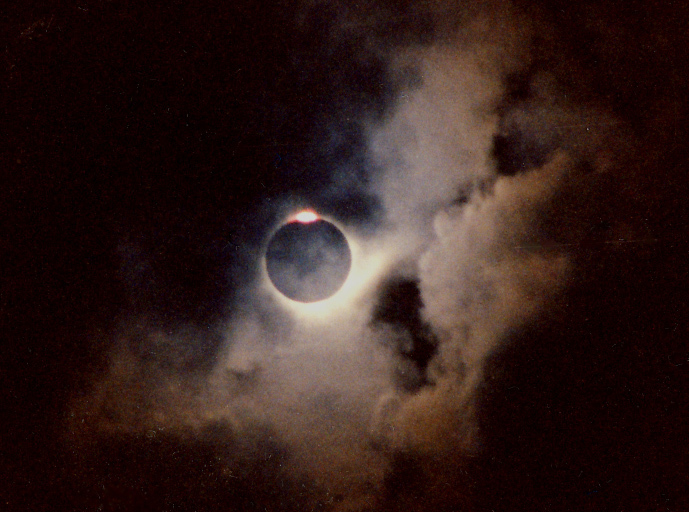 The 1991 eclipse main page. Map of the path of the 1991 eclipse from Fred Espenak and eclipse details at the observation site. A photo of the five people at this eclipse.